A lack of focus and lack of interest are hindering what could be a beneficial economic and political relationship between Russia and the African continent. Russia today does not have a concrete policy agenda for Africa, and offers much less to the continent now than it did during the Soviet era, at least according to Irina Filatova, professor emeritus at the University of KwaZulu-Natal in South Africa and a professor at the National Research University at the Higher School of Economics in Moscow. "Russia is interested in developing economic relations with Africa, but does not have much to offer,” Filatova said. “And what it does have to offer, it does not quite know how to. There are some good projects there on the continent." Although South Africa is now part of the BRICS grouping, this partnership is more about global political relations than connecting Russia with Africa. BRICS does not fulfill the need for a “platform for Russia-Africa dialogue,” in the words of Lesley Masters, a senior researcher at the Institute for Global Dialogue in South Africa. "African engagement with Russia has been difficult, especially in building up economic ties. Relations need to be more visible and opened up to promote greater exchanges across sectors between Africa and Russia. There is not enough understanding in Africa regarding Russia,” Masters said. From Russia’s perspective, there are important geo-political implications for working with Africa. The continent’s 54 states represent a key voting bloc within the structures of global governance. Nevertheless, Russia’s soft power efforts in the region have been limited thus far. Shaabani Nzori, an expert in Russian-African relations says that Russian President Vladimir Putin and his foreign policy team are pragmatic and so African leaders interested in working with them should take a very business-like approach. "Our leaders must formulate exactly what they want and what to expect from Russia, what are they ready to offer in exchange and spell this out very clearly without any bonhomie," said Nzori in an interview soon after Putin was inaugurated in May. "With regard to African mineral resources and Russia's intended role in their exploration and exploitation, we need to be principled and not let Russians determine the agenda on how these our resources ought to be exploited and managed," he said. So far, Nzori continued, African authorities have failed to use mineral assets as trump cards to negotiate better terms when going into contracts with foreigners not only in exploiting and managing the minerals deposits themselves, but also in using them to achieve inroads into other spheres of economic, technical and technological cooperation, for example, obtaining access to Russia's technology and prowess in nuclear power generation or asset-swapping for ownership stakes in Russian enterprises. Dr. Bashir Obasekola, chairman of the Russian chapter of the Nigerians In Diaspora Organization Europe (NIDOE-Russia), a non-profit social organization based in Moscow, said that many people still expect to see a very robust Russian policy implemented in Africa, despite the fact that China has outpaced Russia significantly in Africa engagement in recent years. In June 2009, Medvedev was the first Russian leader to pay an official visit to Nigeria, during which six bilateral agreements were signed aimed at boosting the strategic partnership between the two countries. When Medvedev returned from his trip, Russia’s then-president declared that such a visit should have been made sooner, but that it was not too late for Russia to play a role on the continent. Summing up his trip, he noted frankly that Russia was "almost too late" in engaging with Africa. "Work with our African partners should have been started earlier and that Africa is waiting for our support," he said at that time. "Our policies here will be very friendly, but at the same time pragmatic," Medvedev said, noting that the Soviet Union "always held a very friendly position with regard to African countries, helping them win independence." But despite such ties - particularly with countries such as Namibia and Angola - Moscow's influence has waned since the fall of the Soviet Union, as countries turned to the United States and China. Ana Cristina Alves, a senior researcher from Global Powers and Africa at the South African Institute of International Affairs and lecturer from the Witwatersrand University in Johannesburg, South Africa, thinks that there is a lot of potential for trade and economic cooperation to improve in the medium-long term, but doesn't think Africa is a priority for Moscow right now. "The impression I have is that Russia's engagement in Africa is being mostly conducted by private Russian interests to explore mineral resources without any support from their Russian government," Alves said. “People talk about China, India and Brazil in Africa – Russia hardly make it into the academic discussions here." From the Russian perspective, the challenges of doing business in Africa may outweigh the potential benefits. Andrei Petrov, founder of New African Initiative, a non-profit organization that seeks to change negative perceptions about Russia and help Russian investors in Africa, said that the major problem Russian companies face in their investments abroad is the absence of a system for obtaining financing from the government and commercial institutions. Next to that is related to political risks of investing in North Africa. Due to recent events in Libya, Russian Railways lost many projects, including the construction of the Bengazi-Sirt railway at the total cost of $2.7 billion. Petrov added that it's very difficult to compete with China, which is very dynamic and active on the continent and has low cost financing in sufficient amounts for nearly all investment projects planned for Africa. In his assessment, Rex Essenowo, an economic analyst based in Moscow, said that Medvedev was more focused on Russia-African economic policies during his four years in office compared with Vladimir Putin's previous eight, and businessmen and political leaders on both sides are now waiting to see if Putin will continue Medevedev’s engagement or not. 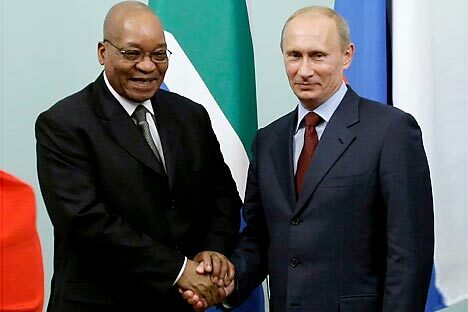 Putin visited only South Africa and Morocco during his eight years as president from 2000 to 2008. Essenowo said that the emergence of BRICS regional bloc presents a good platform to renew trade and economic relations with Africa, but added a caveat. "Let me quickly point out that South Africa is still far away from being the flag bearer in determining African economic policies and integration with Russia, if you take into consideration the potentials that Africa and Russia has," Essenowo said. “We are not lacking the resources to boost the relationship, but the willpower has always been put on hold or totally ignored." Essenowo pointed out that there are many meetings at the bilateral and regional levels between Russia and the U.S., EU and Southeast Asian nations, but there has yet to be a single high-level Russia-African summit. Essenowo believes that there is still a chance to revive Russia’s relationship with Africa if African nations work together to focus on improving the Russian-African relationship.